The giant sequoia tree is one of the largest trees found on earth. Some sequoias are more than 2,000 years old. This tree grows in California and is used for veneer, lumber, plywood, patio furniture, pencils and shingles. The Douglas squirrel lives off the green scales of young sequoia pine cones. The sequoia attracts various birds, including nuthatches and white-headed woodpeckers. 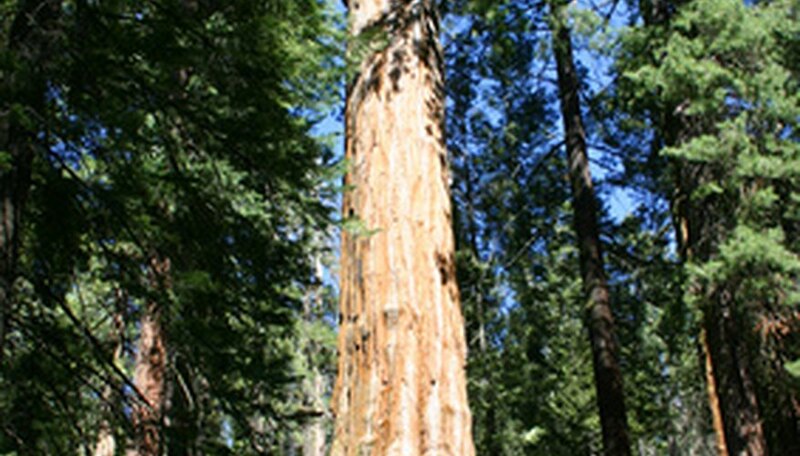 Cankers sometimes affect the giant sequoia. A canker is a sunken area on a branch. The canker infects foliage on the infected branch, which causes the foliage to turn yellow or brown. The foliage eventually wilts. The infected bark secretes resin and is usually discolored. In more advanced stages of canker, you might see fungus on the undersides of leaves and the lower sides of branches. The canker eventually kills the branch, and if bad enough, kills the entire tree. Keeping sequoias healthy allows them to fight of canker diseases. If you notice canker, help the tree by pruning dead and decaying foliage and branches. Prune at least 12 inches toward the trunk from the canker to keep the canker from spreading to the trunk. Heavy fertilization helps speed canker along, so avoid fertilizing the sequoia if it is affected with canker. Botrytis cinerea is also known as Botrytis blight. The blight is a fungus that affects the sequoia's flowers. The flowers become discolored or spotted. The blight causes the buds to rot eventually. Check the sequoia foliage for grayish-brown spores and for twigs that die on the tree. Botrytis cinerea prefers high humidity. Prune affected foliage and branches, even if the branches are not dead yet. For smaller trees, do not water from above. Improve air circulation by thinning out the canopy of the sequoia. Avoid planting sequoia close together as poor air circulation promotes this form of blight. Needle blight affects the sequoia's needles and new shoots, giving them a pink or tan color in spring. You might also notice twigs on the tree dying. According to the University of California, the fungus that causes needle blight is most likely from environmental stress. Keep the sequoia properly watered and fertilized. Provide better air circulation by thinning out the canopy. If you plant sequoias, be sure to leave plenty of space between seedlings, so that as they grow, there is enough air circulation for each tree. Since these trees are large, leave at least 20 feet between the trees as they grow.